The PCV13 vaccine against pneumococcal disease is now available and replaces the PCV7 vaccine for children. If you treat workers' compensation patients, you may soon get a letter telling you that you have been selected for the workers' compensation system's Performance-Based Oversight Regulatory System. Even modest cuts to physicians for treating patients on Medicaid or in the Children's Health Insurance Program 'will actually jeopardize the state's efforts to trim Medicaid costs,' the leaders of organized medicine in Texas warn in a letter to state officials. Physicians prevailed in the courts once again in mid–June when the Texas Supreme Court sided with TMA and the Texas Orthopaedic Association in their 10-year battle with podiatrists over the definition of the foot. "What happens on the border does not stay at the border," Lawrence Kline, DO, of California, a member of the US-Mexico Border Health Commission, told the conference. For example, tuberculosis is a global threat, killing momre than 2 million persons each year. "This is a time bomb in the world, Dr. Kline said. Much of the conversation, however, continued to focus on Congress' refusal to stop the 21-percent cut in physicians' Medicare payments that took effect June 1. 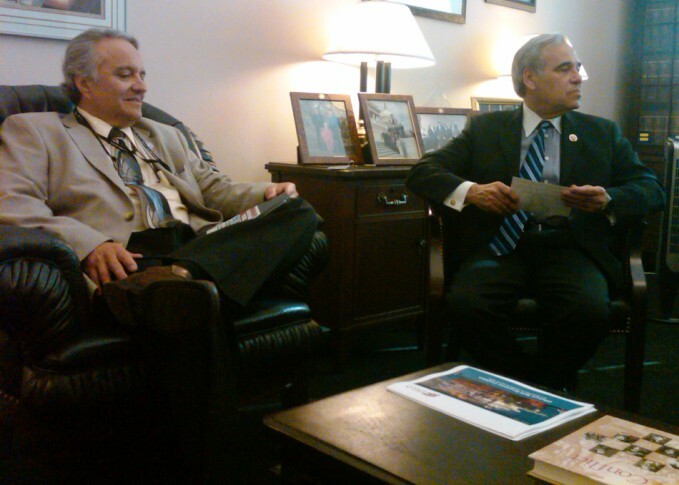 David Palafox, MD, of El Paso (left), visits with Rep. Charlie Gonzalez (D-San Antonio). "This is a terrible way of doing business," Representative Gonzalez said. "If you are hurt disappointed and angry you should be." 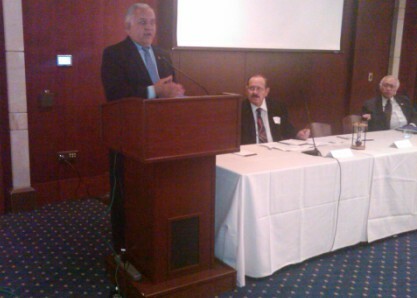 Rep. Sylvestre Reyes (D-El Paso) speaks at the Border Health Conference. Congressman Reyes told Texas physicians to continue to pressure the Senate for a permanent fix for Medicare's sustainable growth rate (SGR) formula. "To continue to keep kicking the SGR fix down the road is the most irresponsible thing [Congress] can do," he said. 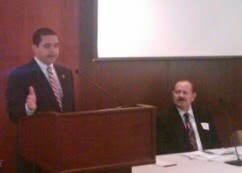 Rep. Henry Cuellar (D-Laredo) addresses the Border Health Conference. Talking about fixing the Medicare payment problem from year to year is not fair to anyone, he said. Representative Cuellar described the dilemma the House is in. "Do we pass something to get the Senate past their elections or do we look long term for a permanent fix?" he asked. Help children in your community realize the importance of safety and exercise with a helmet giveaway during Brain Injury Awareness Month in October. The Texas Health and Human Services Commission (HHSC) will hold a public hearing on June 29 on the proposed 1-percent across-the-board cut in payments to physicians in Medicaid and the Children's Health Insurance Program. Starting Sept. 1, most pain management clinics in Texas must have Texas Medical Board (TMB) certification. 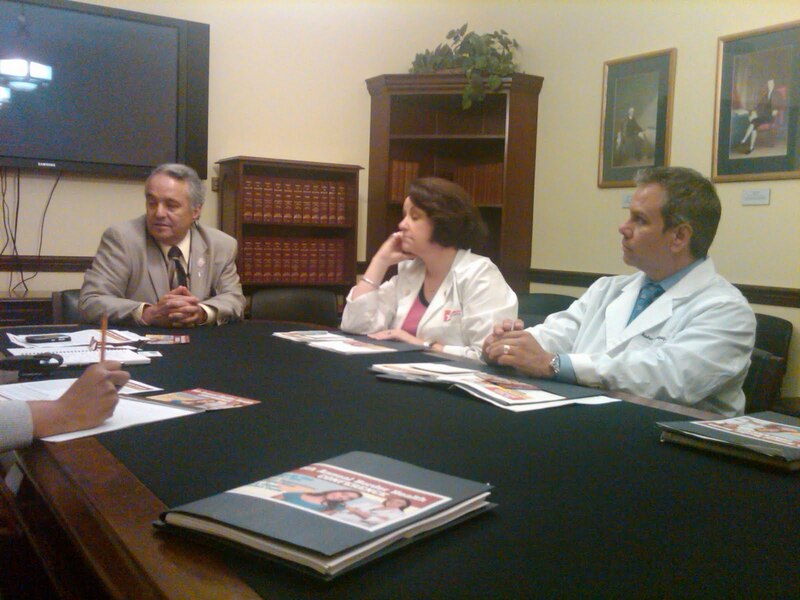 Physician leaders from the U.S.-Mexico border and San Antonio this week are bringing their concerns directly to Washington, D.C., to urge the nation’s leaders to permanently fix the Medicare Meltdown. Physicians representing the Texas Medical Association (TMA) and TMA’s Border Health Caucus (BHC) are meeting one-on-one with U.S. representatives and senators to encourage them to take action to stop the 21.2-percent Medicare cut that took effect Friday, June 18, so patients will have access to a doctor when they need one. One prominent theme we've heard so far is that Republicans are blaming the Democrats and the House is blaming the Senate for holding Medicare legislation hostage. Kristina Culley (left), legislative aide for U.S. Rep. Louis Gohmert (R-Tyler), visiting with Drs. Victor Gonzales of McAllen and Manuel Acosta of El Paso on border health issues and Medicare payment meltdown. TMA President Susan Rudd Bailey, MD, along with El Paso physicians David Palafox, MD (center), and Andres Enriques, MD, explain to Kwamme Anderson, staff person for U.S. Rep Eddie Bernice Johnson (D-Dallas), the many challenges facing physicians resulting from Medicare cuts and Medicaid. Anderson says Congress has physicians' livelihood in their hands. 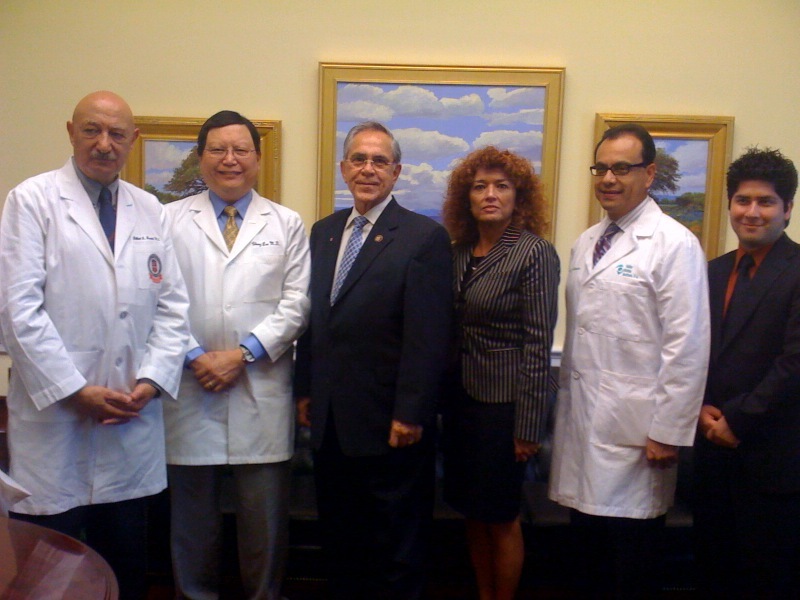 U.S. Rep. Ruben Hinojosa (D-Merceds) center, with (left to right) Drs. Gilberto Handal of El Paso, Chevy Lee of McAllen, Linda Villarreal of Edinburg, Victor Gonzalez of McAllen, and medical student David Espinoza from UT Health Science Center at Houston. Congressman Hinojosa tells us we will know more about the status of the Medicare legislation after the Democratic caucus this evening. His staff predicts that ultimately, maybe next week, it will pass. "My patients tell me that they don't want to lose their Medicare, but if I can't see them, then they've essentially lost their Medicare," Dr. Lee said. Added Dr. Gonzalez, "Medical education is tied to Medicare. If you want more physicians in the workforce, you need a secure Medicare system. It's bigger picture than just doctor payment." 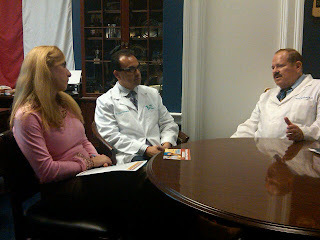 Dr. Bailey and TMA Vice President for Advocacy Darren Whitehurst meet with staff for Rep. John Carter (R-Round Rock). 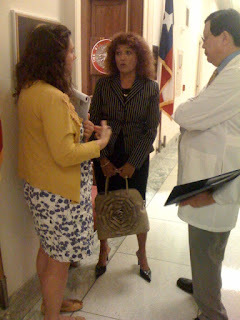 Dr. Bailey and others have a frank and very enlightening discussion with Jenifer Healy, a staff person for Sen. Kay Bailey Hutchison. Main takeaway is that physicians and patients are in a political soccer game with no points being scored. 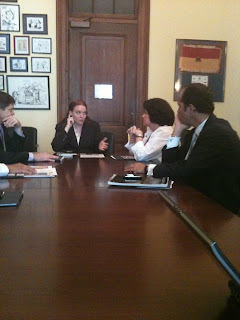 Sarah Whiting from Rep. Joe Barton's tells Drs. 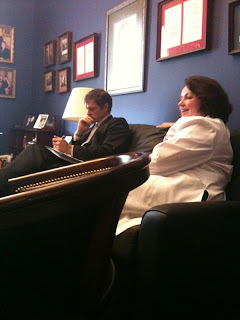 Villarreal and Lee that the congressman supports a short-term Medicare fix today and then a real long term fix. She says Mr. Barton is a supporter of tort reform and sees the need for liability protections in health care reform. U.S. Senate on Friday approved a deal stopping the cuts and raising fees 2.2 percent until Nov. 30. But the House of Representatives had already gone home for the weekend and was not scheduled to resume voting until tomorrow. That led the Centers for Medicare & Medicaid Services, which had held Medicare payments since the first of the month, to direct Medicare contractors to begin processing claims dated June 1 and later under the new rates on a first-in, first-out basis. “Washington obviously doesn’t realize the damage they’re doing to our practices and our patients,” said TMA President Sue Bailey, MD. A video excerpt from The Vanishing Oath, a film directed by Ryan Flesher, MD. CHICAGO -- The AMA House of Delegates finished its work early Tuesday. Here are some Texas photos from the closing day, including the installation of new AMA Alliance President Susan Todd of Fort Worth and the AMA Board of Trustees reelection victory for Joe Annis, MD, of Austin. CHICAGO -- If organized medicine in Texas were a corporation, our most valuable assets would be our human resources. We are blessed with fantastic physician and alliance leaders who make us great. In the past decade, few have shined more brightly than former TMA Alliance President Susan Todd of Fort Worth. She also has led our TMA Foundation and is the driving force behind TMA’s First Tuesdays at the Capitol. Tomorrow, she takes her starring role to the national stage when she takes office as president of the AMA Alliance. Monday night, TMA and the TMA Alliance threw a Texas-style celebration of Susan's achievement. Her colleagues from Texas and around the country came by to pay tribute. "To do something better, you must work an extra bit harder," said TMA EVP Lou Goodman, PhD. "For Susan Todd, that’s a constant state of mind, a disposition. Congratulations, Susan!" CHICAGO -- Sunday, June 13, is reference committee day at the AMA House of Delegates. The house splits up into eight committees to gather member testimony on reports and resolutions before the house. The reference committees' recommendations form the starting point for full house action later in the week. The members of the Texas Delegation to the AMA have work groups for each reference committee. Based on TMA and AMA policy, they devise a Texas position for each report and resolution, monitor the reference committee debate, and add their own testimony. As part of its campaign to help Texas physicians survive and thrive in the new health care environment, TMA offers Health Reform School. Join your colleagues in telling Congress enough is enough. Repeal the Medicare SGR! CHICAGO -- At the Annual Meeting of the AMA, delegates from every state and specialty society are staging a "Write Coat Rally" by writing messages urging Congress to repeal the Medicare SGR on white coats that will be delivered to Capitol Hill. "Help me help patients." You can join the rally today by delivering a message to your representatives in Congress through the AMA Physicians' Grassroots Network toll-free hotline at (800) 833-6354. "Save my practice." Tell Congress that unless they act now, more physicians will be forced out of the Medicare and TRICARE programs and seniors and military families will lose access to the doctors they trust and the care they need. Call (800) 833-6354 today and tell Congress enough is enough. Repeal the Medicare SGR! CHICAGO -- San Antonio internist Jayesh Shah, MD, is one of a half-dozen physicians featured in huge posters outside the hall of the American Medical Association House of Delegates. 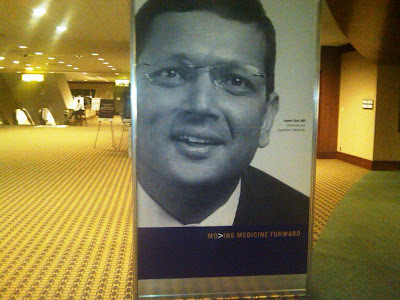 The posters are part of the AMA's "Mo>ing Medicine Forward" campaign. Dr Shah is the chair of the AMA International Medical Graduate Section. Update: CHICAGO -- Live blog cancelled. Am told the "open forum" is actually a "closed forum." From 4-5 pm, Saturday, June 12, the American Medical Association will conduct an open forum on health system reform at the AMA House of Delegates meeting. Please join us for a live blog of that event. CHICAGO -- Three physicians are asking the AMA House of Delegates to make them AMA president-elect when the house votes on Tuesday. All three of them -- Drs. Peter Carmel of New Jersey, Joseph Heyman of Massachusetts, and Edward Langston of Indiana -- asked the Texas Delegation for their votes Saturday. 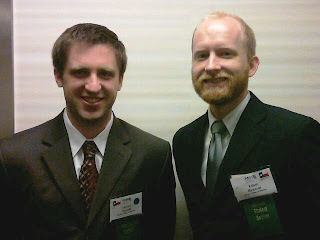 CHICAGO -- Elliot Richards (below, right) a first-year student at Baylor College of Medicine was elected chair of AMA Medical Student Section Region 3. Andrew Harrell another first-year student at Baylor was elected Secretary/Treasurer. TMA joined the American Medical Association, American Osteopathic Association, and several national specialty societies in supporting H.R. 5295, the Healthcare Truth and Transparency Act of 2010, that outlaws any health care professional from misleading patients about their level of training in advertising and marketing. It's too late to file a claim, but physicians still need to make sureBlue Cross and Blue Shield (BCBS) continues to honor the terms of its settlement of a 2003 federal class action lawsuit that claimed numerous BCBS plans were involved in a scheme to defraud doctors in violation of the federal Racketeer Influenced and Corrupt Organizations Act (RICO). Starting July 1, the Texas Medicaid PCCM and fee-for-service programs will allow physicians to perform only three obstetrical ultrasounds during a pregnancy without prior authorization. The Texas Medical Association Political Action Committee(TEXPAC) has endorsed Republican former State Sen. David Sibley to fill the unexpired term of Sen. Kip Averitt (R-Waco), who stepped down due to health concerns. Thanks to hurricanes Ike and Rita, Texas physicians along the Gulf Coast know all too well the devastation a storm can wreak on their practices. Hurricane season has started and the National Oceanic and Atmospheric Administration expects a busy season. Here are some tips to make sure you and your practice are ready. Following up on actions last month by the TMA House of Delegates, the Texas delegation is bringing a pair of resolutions to Saturday’s AMA house meeting. Resolution 115 calls on AMA to support legislation in Congress to allow Medicare beneficiaries to make tax-free contributions to health savings accounts. Resolution 116 would change AMA policy to prevent paperwork delays at CMS from penalizing physicians who provide care for Medicare patients. Check out Blogged Arteries for progress on these two items.